NOIR CITY, The Annual San Francisco Film Noir Festival, began in January, 2003. It immediately grew into the largest film noir-specific annual event in the United States, the centerpiece of the Film Noir Foundation’s public awareness campaign. Viewers are drawn every January from all over the world, eager to submerge themselves in a ten-day extravaganza of rare films, special guests, music, literary tie-ins — a communal celebration of all things noir. 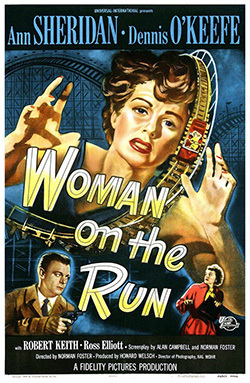 One of the earliest triumphs of the NOIR CITY festival was working with Universal’s distribution department to unearth a pristine, never-before-projected 35mm print of Woman On the Run, a long-forgotten noir classic from 1950 that was the biggest hit of the inaugural NOIR CITY festival. This minor masterpiece, starring Ann Sheridan and Dennis O’Keefe, and directed by Orson Welles protégé Norman Foster, is now back in circulation on the rep cinema circuit. 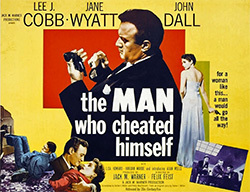 Festival organizers have reached into archives around the world to show such rarities as Joseph Losey’s 1951 remake of M, Ben Hecht’s dazzling 1934 proto-noir Crime Without Passion, and Martin Scorsese’s personal prints of two little-known classics, Try and Get Me (1950) and City That Never Sleeps (1953). Other long-neglected films that have delighted lucky NOIR CITY audiences include: Race Street, Nora Prentiss, Shakedown, The Sniper, Tomorrow Is Another Day, Christmas Holiday, Desert Fury, The Velvet Touch, Decoy, Edge of Doom, City Streets, Larceny, The Scoundrel, The Man Who Cheated Himself, Nobody Lives Forever, The Breaking Point, and The Window. For more information, visit the official NOIR CITY site.